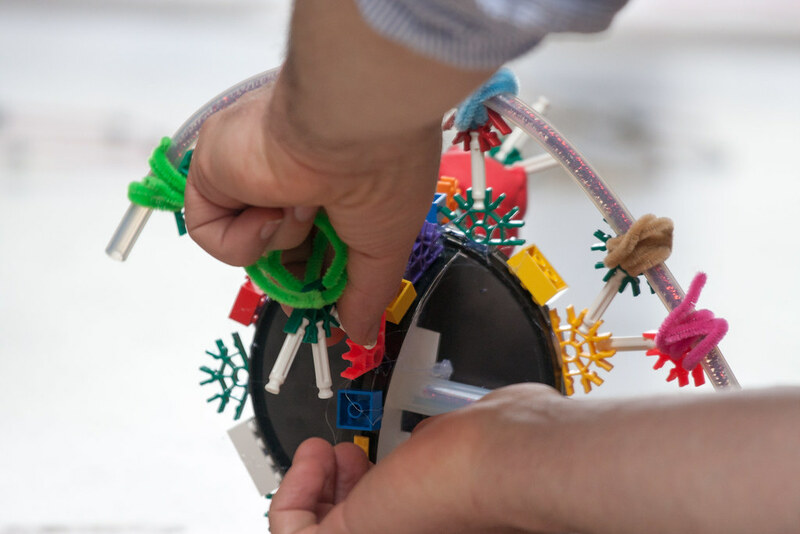 The first workshop for Viruscraft is now complete – merging biologists with craft practitioners and researchers, we began to prototype a tangible interface game to understand why viruses infect some hosts but not others. We like to push projects as far along this scale as possible. For Viruscraft it may be that the outcome is an educational project, as it is not clear yet what data could be collected through a citizen science approach. 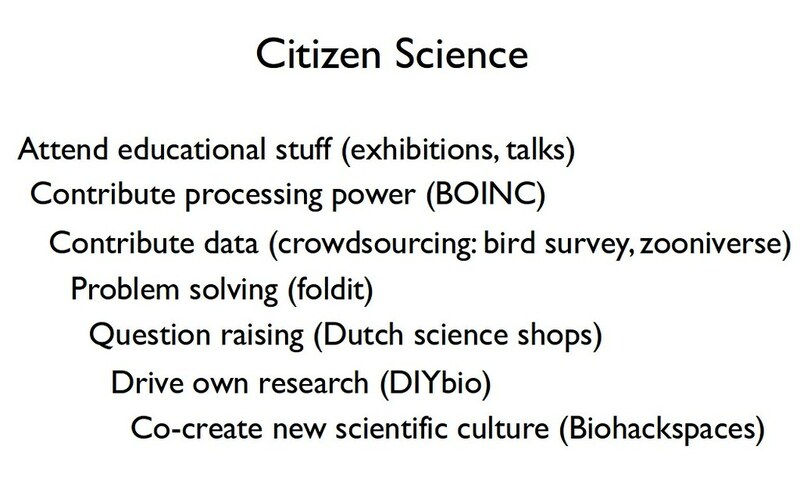 We realised that the workshop itself is citizen science, and on the scale above could be categorised as ‘Question raising’ as our participants raised valuable ideas and questions of the research, in direct contact with the scientific researchers. A broad range of people took part in the first workshop - four researchers in virology, evolution, health and policy, an architect/designer, an animator/community arts organiser, a sculptor/marine biologist, a biomimicry-basket weaving-architect, a carpenter and makerspace owner, a creative-lead from the Eden Project, and three generalists from FoAM. We started the workshop by talking about the motivations behind the project, taking people through the concepts of transdisciplinary research, appropriate technology and citizen science, followed by an introduction to virus evolution research from Ben Longdon. Then, divided into four groups to start to summarise the pathway from virus genetics → virus structure → how viruses infect hosts → transmission between hosts → disease outcome, using any medium. The models and sketches were brought together into a complete pathway, so all particpants had an understanding of all parts of the process. The lunch was designed and made by local chef Hoon Young Kim (김훈영) who we’ve been wanting to work with for some time. Hoon has a deep appreciation for ingredients and how they are treated, including foraging locally to find equivalent plants to those in Korea. 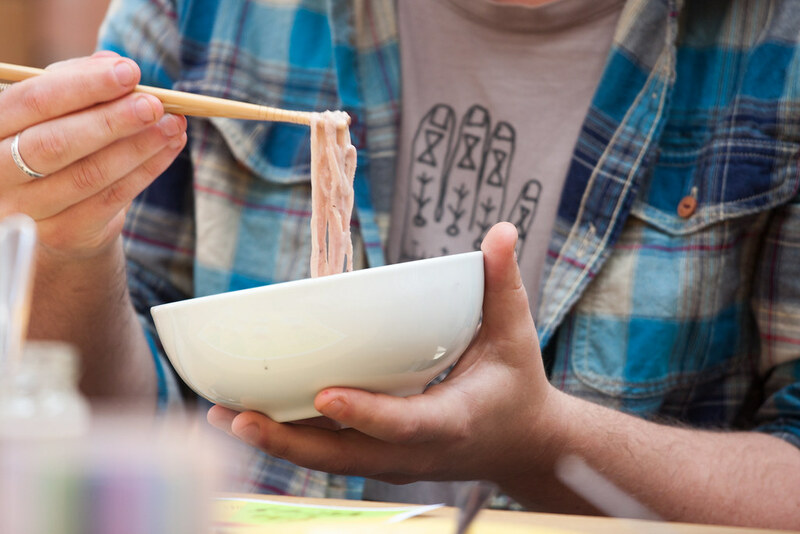 Hoon took the topic of the workshop and used it as inspiration for the dishes he designed – his craft was a valuable addition to the other crafts represented. It’s not easy to find someone so skilled and with an approach that fits so well with the way we work at FoAM. At the end of lunch we looked at some tangible interface examples – InFORM and Reactable – and took time to play with the Pattern Matrix interface. This was followed by an introduction to games design, including games mechanics, artwork, story building and technology. In the afternoon participants split into new groups to build quick model prototypes: (i) genetics and game interfaces (ii) virus structure and game/installation design and (iii) host outcome and game world. - Large structures seem to be the way forward – go bigger and use more space as that makes people play more. - Virus inspired tangible forms should be our focus – this was what most people were drawn to. - Stick to one or a couple of concepts and avoid overthinking/overcomplicating. - The prototype mutation game involving matching DNA base-pairs could be made into a quick minigame. - As well as thinking of physical objects as the input mechanism, they can be an output too - making them reactive using sound, actuators, vibration or light. - Play with size? Shrink rays – big virus structure that can be modified and change what happens in a tiny game world (e.g. in a petri dish) – or tiny viruses that change a bigger structure. 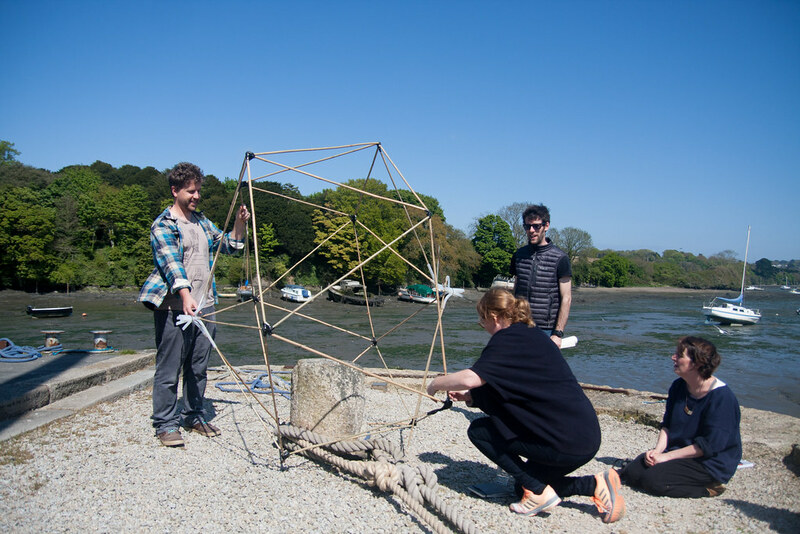 - Make giant origami modules that fit together and use embedded sensors so we can detect the resulting shapes. - Could do stop-motion animation of infection as an art direction, e.g. animate the lego/knex model. 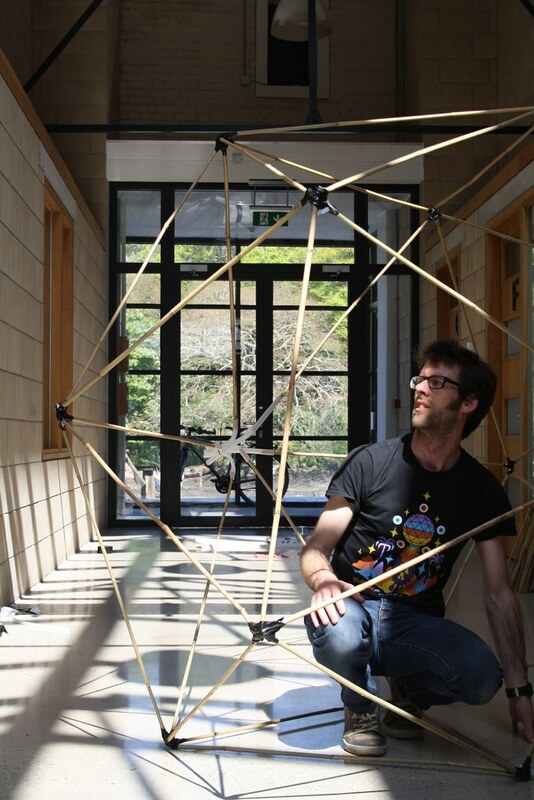 - Giant 3D virus structure as a dance mat climbing frame. - We got the best results from groups where every member was equally out of their comfort zone. As tempting as it is to put people in groups that fit their interests, people were less able to think freely if they were working on their specialist topic. 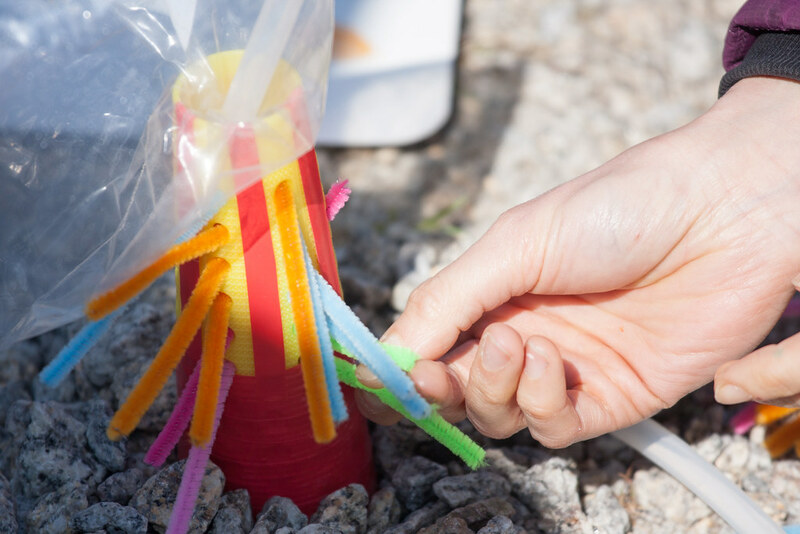 - In the morning session where groups were tasked with understanding part of the pathway from virus genetics → host disease outcome, most groups instinctively chose a crafts-participant to explain what they had done. These explanations were the most clear, as they only contained the necessary information with no excess detail. - In future for similar workshops we may limit group tasks to only using materials that are not paper-in-2D. Manipulating different materials brings a different way of thinking to writing notes and drawing diagrams on paper – this may be a particularly beneficial limitation for bringing the academically-minded participants into a more free mode of thinking. - This was the first time we have done a workshop where we have not made the lunch ourselves. We want to find a way of costing in the food properly as a full collaboration - so far we’ve budgetted for ingredients only. It may be that we simply need to increase our costs for these workshops – funders are always keen to see the most people through the doors for the lowest budget so this will take some thought. - We positioned parts of the workshop in different spaces, to keep people moving and changing pace. Our studio space consists of a large area with a round table where we run workshops, and a small private studio area where we work day to day. In future we would like to fit black-out blinds to the private studio, and replace the tables with folding versions, so we can use this space for showing films/projections – the main space is too bright to allow this, which has proved a limitation. - The timings and spatial movements were carefully planned. In future we need to bring the full group involved in leading the workshop together the day before for a schedule rehearsal so everyone is familiar with the flow. 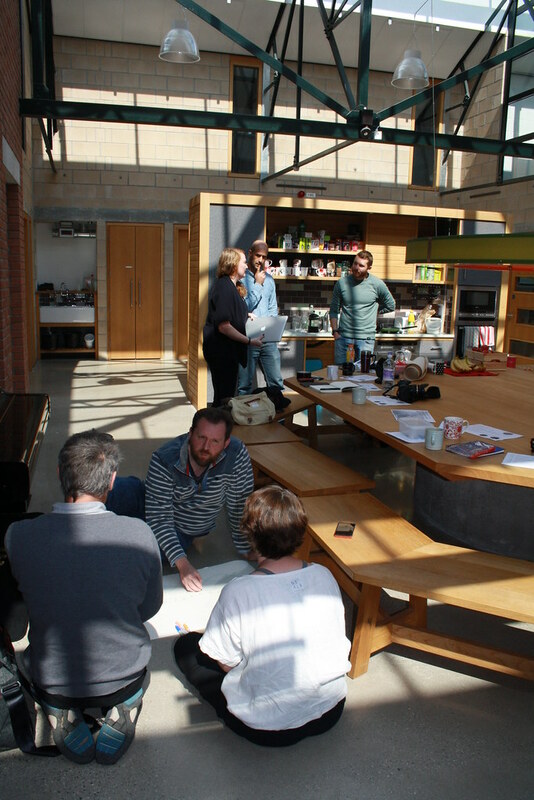 - We like to design our workshops so that anyone can come, and not feel that there are barriers to their participation. This time we were joined by a five-week old baby, our youngest ever workshop participant. We made a separate quiet space for feeding, and the building has clean and comfortable changing facilities – next time we will also make a more comfortable space within the main workshop area to allow more choice. - For future workshops we would like to actively encourage parents to bring their children, so we have a greater range of ages and ideas. - Due to two cancellations at the last minute, and a slight gender bias to begin with (7f:9m), we ended up with a poor gender bias for the workshop (5f:9m). We will make more effort to ensure the balance is met beforehand to try to avoid this situation in future. We are also trying to focus on broadening our socioeconomic diversity, through identifying people who are hubs/key nodes in their communities and inviting them. In future we will extend this by more actively seeking out participants who do not have connections to local universities – something we do already but could do better. - We kept the numbers lower than for our usual workshops (17 as opposed to 30), which proved much more manageable and a good group size allowing everyone to meet and feel more relaxed. Ideally we would like to keep our events at this smaller size in future. 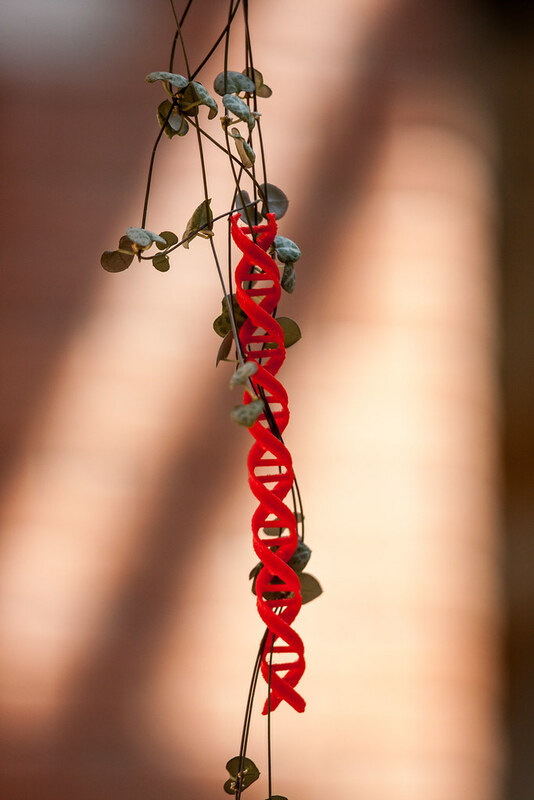 - We had two main parts to the workshop – in the morning understanding the pathways from virus genetics through to disease outcome, and in the afternoon picking specific parts of this pathway to develop through physical models. For both parts, we divided up the science participants into topic-groups and let the craft participants choose which group to join. In future with categorisable participants like this we will flip the focus - in this case the afternoon may have been better split by craft materials with each group led by the craft specialists, and with the science participants choosing which group to be in. There were two motivations behind catering the viruscraft workshop. Firstly, it should be in line with the brief and explore some aspect of the subject by way of food. Secondly, and just as important, it should be tasty and filling! On the menu was noodles in a cold soy bean soup, with the following side dishes; fermented beetroot, wild garlic kimchi, blanched local greens, boiled mouli, black sesame broth and powdered grains. 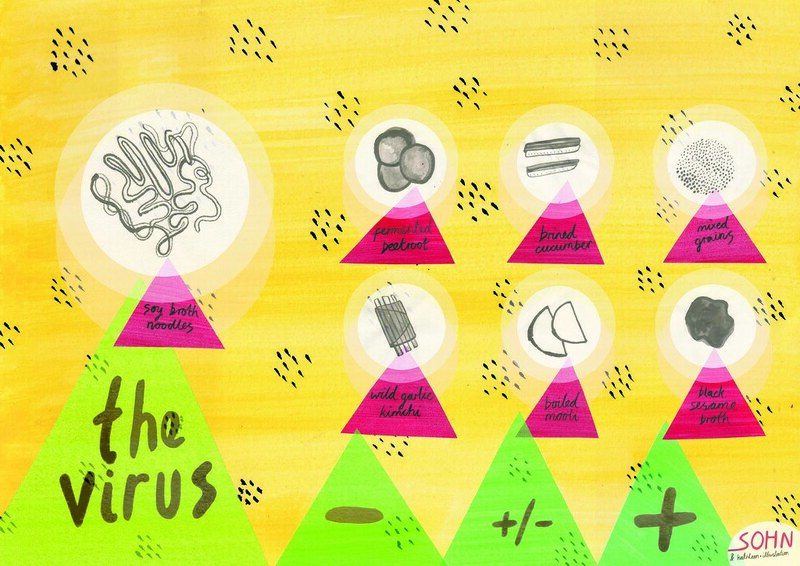 The noodle dish acted as the virus and the side dishes represented positive, neutral and negative mutations. Taste was the 'function' and people the hosts. I hoped to present a variety of geometry and colour, as well as a playful method of eating, with the control of flavours resting in the clients' hands. In retrospect, perhaps 3 side dishes as opposed to 6 would have been enough, and potentially enhanced the analogy. Soak the beans in cold water for 12 hours, using twice as much water as beans. Bring a pan of fresh water to boil and add the drained beans. Simmer for around 15 minutes, occasionally stirring and skimming the foam. Taste a few beans to check they are done. You want a slight bite and a smooth chew. Even a slight chalkiness will create a rough texture in the soup. Discard the water and cool the beans immediately in cold water. Gently rub the beans between your fingers to peel them. The skins float, so you can slowly pour away most of them. This will take a little while, but is worth it to be thorough as the skins create a rough texture in the soup. Blitz the beans in batches, adding a little water as you go to create a paste. Blend until completely smooth, then add more water and seasoning to reach the right consistency (that of a light smoothie). If you have the patience, instead of adding water, you can squeeze in the juice out of half of the beans once you have blitzed them, discarding the solid. This will make create a fuller flavour, but you will make less soup!